As an avid cyclist, I have a hard time naming my favorite multipurpose trails. But especially after considering their proximity to Pittsburgh and Allegheny County; their multiple access points for comfortable out-and-back rides; their nearly level surfaces, some of which are paved; sufficient trailhead parking and proximity to apres bike restaurants and related businesses, these stand out. 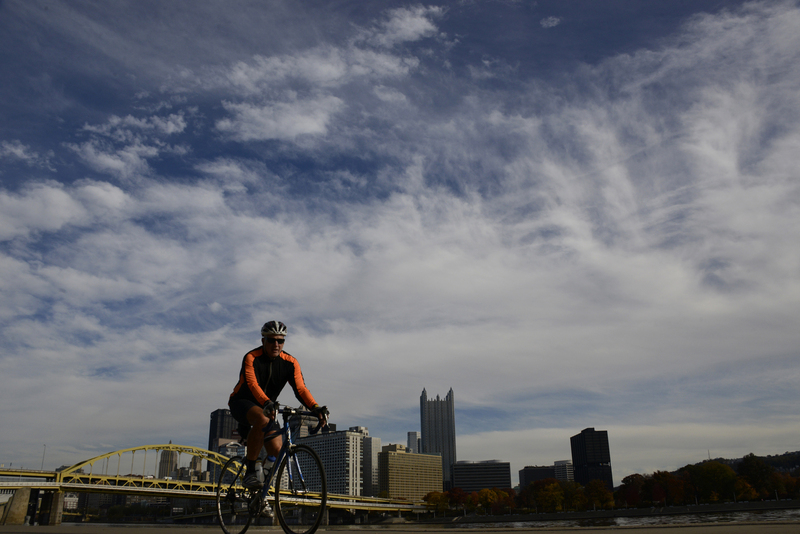 The Armstrong Trail, part of the work-in-progress Erie to Pittsburgh Trail, extends 30 miles along the Allegheny River from Rosston to East Brady. Along the way, bicyclists use the former right-of-way of the Allegheny Valley Railroad and roads to reach Ford City and Redbank in Armstrong and Clarion counties. The trail meets the Redbank Valley Trail system at Redbank, an intersection that has an improved parking lot, picnic tables and other amenities. “Our trail is rich with history, from Native Americans to river travel to iron production to the railroads,” said Toni Henry, secretary of the Armstrong Rails to Trails Association. Updated trail maps published this past fall highlight its features. This is an easy-on, easy-off trail along the Allegheny, Monongahela and Ohio rivers suitable for all ages and all ability levels. It’s level, it’s paved and it’s open year-round. Some segments are cleared of snow for winter riding. First-timers to the 24-mile trail who have their own bikes can park their vehicles beneath the Birmingham Bridge on the South Side. The trail passes right through the extended parking lot. If you need a bike, Golden Triangle Bike Rental (bike-pittsburgh.com) is across the Mon via the Smithfield Street Bridge and tucked between the PNC building and the First Avenue Garage. The trail goes right by it. Those who pedal upstream along the Mon on the South Side will pass the practice fields for the Pittsburgh Steelers. The Waterfront complex, just past the vantage point of the bald eagles’ nest, is a good turnaround point. Those who head downstream will pass the Station Square complex and can ride beneath and then up and over the Fort Pitt Bridge to Point State Park. Cross the Fort Duquesne Bridge and take your choice of directions. If you go downstream, Bicycle Heaven (www.bicycleheaven.org), which bills itself as “the world’s largest bicycle museum and shop,” is two blocks off the trail at 1800 Preble and Columbus avenues. Chances are good that owner Craig Morrow has at least one of the bikes you rode as a youngster. This scenic former right-of-way of the Western Maryland Railway was the first completed segment of what is now the Great Allegheny Passage. The easy-to-ride 11-mile trail through Ohiopyle State Park has a crushed limestone surface and parallels the Youghiogheny River. Interpretive signs tell the story of the area’s coal and logging history and the tiny towns, now long-gone, that housed their workers. Wooden benches, many built in memory of local trail users, welcome bicyclists to take a break to savor their surroundings. Wildlife frequently seen along the trail — and sometimes across it — include whitetail deer, high-stepping turkeys and scampering chipmunks. Although beaver and otters aren’t often seen, they share the river with canoeists, kayakers and rafters paddling their colorful craft toward Ohiopyle. Several flights of wooden steps accessible from the Ramcat Trailhead lead to the river’s edge. They provide anglers with easy access to a 3-mile trophy-trout section. Bald eagles and osprey also compete for the river’s bounty. This well-established 12-mile scenic trail in Maurice K. Goddard State Park in Mercer County got its lengthy new name this fall. It honors the first secretary of the state Department of Conservation and Natural Resources (1995-2003) and the longtime president of the Western Pennsylvania Conservancy. The trail, which has paved and roadway sections, has two segments: The first travels along the north shore of Lake Wilhelm and is designated for bicycling, hiking and snowmobiling; the second is open for biking, hiking and cross-country skiing. Be aware that the terrain can be challenging. The cross-country team from Lakeview High School in nearby Stoneboro trains on the trail. Mr. Oliver, who lives in Sewickley, is a frequent visitor to the 2,856-acre park, where he hikes and enjoys boating and fishing on its 1,680-acre lake. The park is near Exit 130 of Interstate 79. The main parking area is on Lake Wilhelm Road between the park office and a bridge. One of the newest trails is a 12-mile section of the Montour Trail that leads from the recently renovated 506-foot Library Viaduct to the end of the trail in Clairton. It’s one of the most scenic sections of the 46-mile Montour Trail that, when completed, will begin in Coraopolis and continue through Allegheny and Washington counties to Clairton. Multiple sections totaling more than 40 miles have been completed, but there are a few gaps in the southern section. Most of the newest segment is heavily wooded and populated with a variety of wildlife. “It is one of the most sylvan sections of the Montour Trail,” said Ned Williams, president of the Montour Trail Council. Bicyclists can park their vehicles at a small parking lot at Stewart Road. I suggest parking at or near the Clairton end of the Montour Trail and pedaling 12 miles up to the viaduct, taking a break and then riding back to Clairton.